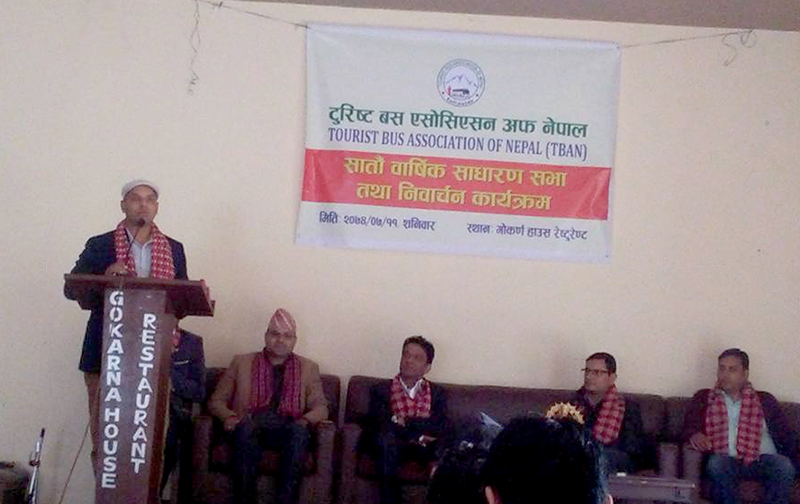 KATHMANDU, Oct 29 : A new Working Committee of Tourist Bus Association – an organization of tourist bus entrepreneurs – has been elected. The seventh convention of the Association elected a new working committee under the leadership of Prahlad Lohani. Among other elected are Dhakanath Kafle (first vice-chairperson), Bhishma Neupane (second vice-chairperson), Krishna Acharya (general secretary), Dipendra Adhikari (treasurer) and Rupen Shrestha and Bigyan Bhujel (members). Newly elected general secretary and Yeti Adventure Tours and Travels proprietor Krishna Acharya said that the committee will perform in a more active manner to enhance the effective service delivery of tourist bus by facilitating the movement of tourists smooth and convenient. The Association is the umbrella organization of entrepreneurs of well-appointed buses operated with focus on tourists in popular tourism destinations, Pokhara and Sauraha.